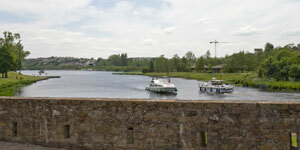 Enniskillen Castle and its museums are on the banks of the River Erne. Enniskillen Castle is in County Fermanagh, Northern Ireland. It is built on the banks of the River Erne between the upper and lower lakes of beautiful Lough Erne. The buildings at the castle are very well maintained and house many displays which give you a complete history of the castle and the associated power struggles. The 17th century "Watergate" is a three story structure with twin towers and conical turrets. The castle Keep, the bottom of the castle tower, now contains the regimental museum of the Royal Inniskilling Fusiliers. The museum shows you the history of the regiment from 1689 until 1968. A newer heritage center to the east is home to the Fermanagh County Museum. You will enjoy studying wildlife, archaeology and local history. You will want to stop for refreshments after your tour and buy souvenirs from the book and gift shop. The original castle was a tower house built in 1415 by Hugh "The Hospitable" Maguire, deputy chieftain of Fermanagh and younger brother of King Thomas Maguire (Thomas the Great). It was built in resistance to the English and to guard one of the main waterways to Northern Ireland. During the 1400s, the Maguires promoted music, poetry and other education. The time was peaceful, except for periodic warfare by nearby clans. 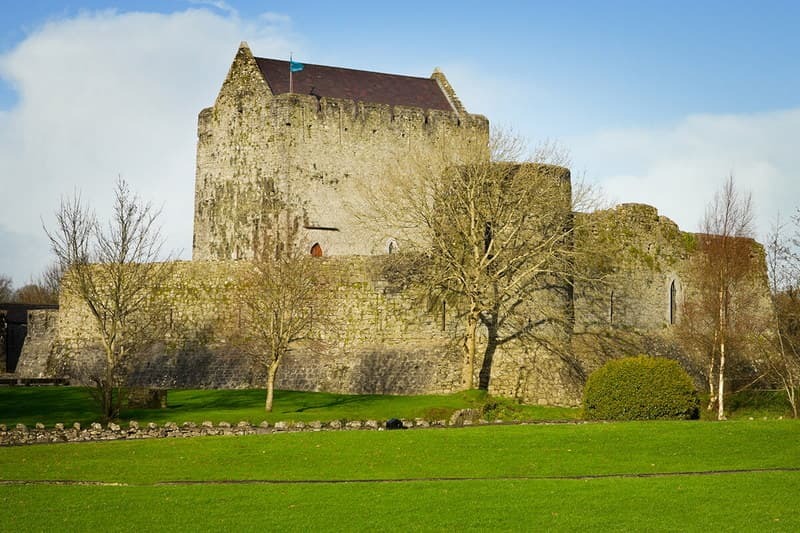 Over the 1500s, the English, and the neighboring clans of the O'Neills and the O'Donnells attacked the Maguires and traded control of the castle. Cuchonnacht Maguire destroyed the castle to keep it from the English. Niall Garbh O'Donnell and a force of English finished the destruction in 1602. A peace settlement was made, Cuchonnacht was pardoned, and he was to receive half of the county. However, he organized the "Flight of the Earls," left Ireland and was named a traitor. The English took control of Enniskillen Castle. They granted the property to Captain William Cole who built the existing castle on the old foundation. 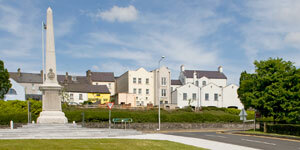 He added the other buildings to help protect the new plantation town of Enniskillen. 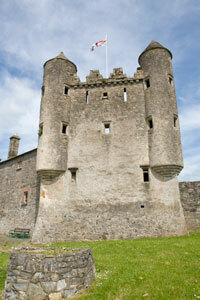 The Watergate was added to the castle; the flag of St. George was flown by the soldiers defending Enniskillen. 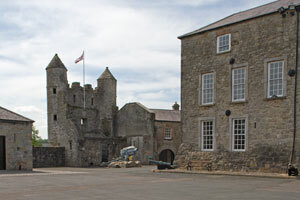 In 1796, the castle buildings were remodeled into barracks in response to the threat of a French invasion. They stayed in military use until 1950. 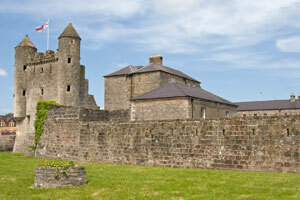 For a full history of Enniskillen Castle, follow the outline at the Enniskillen Castle and Museums website. The castle is located on Wellington Road in Enniskillen. There is free parking next to the castle. If you drive from Donegal to Enniskillen, you can come on the west side of Lower Lough Erne on the A46. If you make this trip, you may want to stop at Belleek Pottery, Tully Castle, and Monea Castle before visiting Enniskillen. When you come into Enniskillen, you will cross the Erne (West) bridge on Ann Street. You then turn right on Queen Street and left on Wellington Road as you see the castle in front of you. Follow the signs to the parking area. 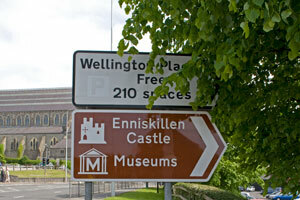 When you come in to Enniskillen from the east or west, you will be on the A4. 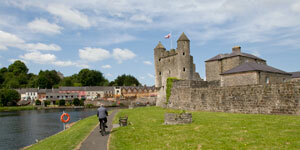 While you are in County Fermanagh, you can enjoy golf, hiking, cruising and siteseeing. Click on "Tourism" at the Fermanagh District Council website to explore your options!